Q: Do we really need a player rankings systems for Flames of War and Team Yankee? A: The honest answer is no, but we do not need to play games or paint miniatures either. Rankings are an aspect of the hobby that encourages the hobby to grow and enhances the spirit of competition. Q: What are the eligibility requirements for a tournament’s results to be posted on rankings? A: There are no eligibility requirements, but there are a few things a tournament organizer (TO) can do to be more likely to host a successful event. First, the event should be open to everyone and advertised at least 30 days in advance on the Battlefront Forums, Facebook, etc. Second, the tournament details are clearly defined. Example of details to be posted: points, era, open vs themed, strict red versus blue or Swiss format, random missions or battle plans, etc. 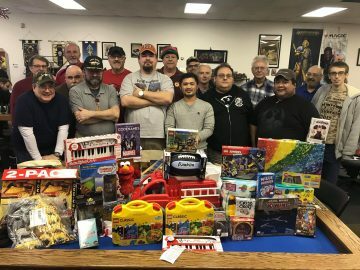 Here is an example of a good informative post – 2018 Adepticon FOW/TY Announcement. Q: If I want to have my tournament included in the ranking results, do I have to use the official Battlefront points for the current season? A: No. It’s your tournament, so run a era and point level that you and your local players would enjoy. The official Battlefront points are for Battlefront run events such as Nationals. Q: Do I need to use the Excel spreadsheet provided by the Battle Rankings site to submit my tournaments results? A: By filling in the fields on the provided Excel sheet, you are guaranteed to send in all the data Battle Rankings needs to process your tournament. Also, since the provided sheet is the tool we use to upload data in the database, it will speed up the process. The form can be found here -> Rankings Tournament Submission Excel Form. Q: I understand the importance of using the Excel sheet to report tournament results, but I don’t know how to use Excel, or I do not own Excel. What should I do to submit results? A: If you have Excel but are not sure how to use it, no worries. After you download the Excel file, double click the file to open. Once open, just fill the cells by clicking each one at a time and type. The sheet will guide you. If you don’t own Excel, no worries. There are free alternatives that will achieve the same results. You can find some suggestions at http://articles.bplans.com/4-free-alternatives-to-microsoft-excel/ . If nether of these are an option for you, get help from a friend. Q: On the Ranking Tournament Submission Excel Form, why does it matter how the player’s name is spelled? Q: How are tournaments scored? A: Each tournament is scored using the following formula: First place = 76 + (# of players [max 48])/2). Every score after the first is proportionally reduced. Example: a sixteen person tournament, first place = 84. Second = 84- 1(84/16) = 78.75. Third = 84-2(84/16) = 73.50, and so on. Q: How is a player’s season score calculated? A: The season score is calculated as the sum of your top 4 tournament points over the past 365 days. Q: What is the FOW tournament season and why is it important? A: The tournament season starts on October 1st and ends on September 30th the following year. At the end of a season, the number one ranked player is that year’s champion, and Battlefront uses Rankings to determine which players get invitations to play in the Masters Tournament. A: Masters is an invitation-only event hosted by Battlefront each year in November for the top eighteen players in United States and Canada. The invitations, location and date are officially announced during the second week of October. See the box below on how the 18 players are selected by Battlefront. 1. The the previous year's Masters Champion. 2. Winner of Adepticon Nationals (March in Schaumburg, IL). 3. Winner of West Coast Nationals (May in San Francisco, CA). 4. Winner of the Nationals at Historicon (July in Lancaster, PA). 5. Winner of Canadian Nationals (September in Ottawa, Canada). 6. Number one ranked Canadian player (if not previously invited). To get to 18 players, the highest 11 ranked players who have not already received an automatic invitations will receive an invitation. If there is a decline, that invitation will proceed to the next ranked player. Q: My name in the database is not correct, or not how my friends address me. Can I change my name? A: The short answer is yes, but only once. Email the Admin at Admin@BattleRankings.com that you want a change. We will need to validate who you are before the change will be processed. Host the North America Rankings for Flames of War and Team Yankee. To be the main resource for tournament organizers and players. Free Service to the Flames of War and Team Yankee Community.